Thanks for sharing Clint. An exponential phase is up and coming, perhaps to coincide with ETF adoption either this year or early next year. Very interesting. It’s a very depressing market. If you need a smile because your crypto investments are down in the dumpster. If that was a heart monitor - we’d be calling for a defibrillater - OR a Priest ! I am looking forward to buying it at the bottom! Interesting how there has been talk of the big banks condsidering “Getting involved” and amazing that it got to $20,000 EACH ! If the zealots are to be believed, it costs around $6,000 to “make one” so price is now below the cost of production. “Attributed value” has at it’s peak been several Trillion Dollars and as @Clint points out so eloquently in his recent charts, it seems now to be dead in the water. The whales don’t seem to have the resources (or the power / inclination ) to hold that $6,000 floor they have been supporting any longer. 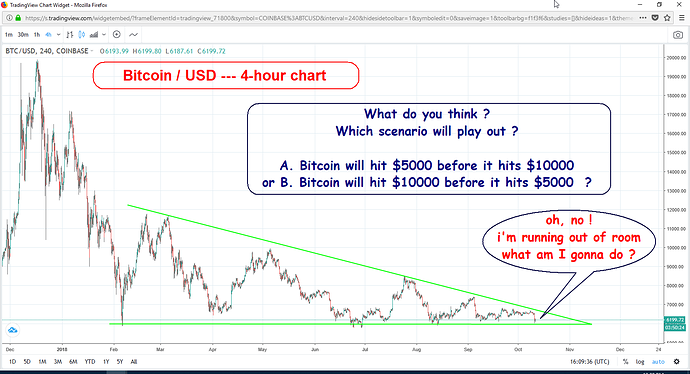 Will “they” put in another floor at $5,000 ? $4,000 ? $500 ? or have they during the course of @Clint s Wedge distributed their holdings in true Wyckoffian style ? I wonder whether “they” will bring out Legislation / Regulation to “prevent it happening again” in true “Regulator” style - After the horse has bolted ? As I said though, it is amazing how the thing went through the roof AFTER it was obvious that it was entirely unsustainable. Just like the “dot-com bubble” and various “Housing bubbles” regularly do. Perhaps I can learn to jump aboard these various “madnesses” and make a real killing before baling out ? I don’t know - the thought is good, but will I have an Appetite for it when the next one pops up ? Why do I think I won’t ? Perhaps I can learn to jump aboard these various “madnesses” and make a real killing before baling out ? I went in with a very small amount just to take advantage of the mass hysteria. Easily the most fun I’ve had in years. Easily the most fun I’ve had in years. Oh you will ! It happens periodically. There was another plunge down to 5200 at 10;00 on the 15th followed by yet another at 14;30 - again with a short covering buy half an hour later. I think somebody big has been giving themselves a nice pre Chrismas bonus in the “short” department here - although I don’t know how this would work with the execution times we have been told of ? It looks pretty certain from the chart tho’ that a great degree of concerted effort has been put in to this movement and I suspect “they” could now be gradually taking up new shorts ? Whether this is “Whales” baling out, Big traders acting in unison to drop the price (My own feeling is this) - or “Officialdom” deliberately pushing the price down to punish the “upstarts” ? I don’t know but That chart looks so clean, that it seems almost “noise free” - I don’t remember seeing one that clean before ! My hypothesis is that many big players with an interest in keeping the market alive (exchanges, ultra whales and coin creators) were working together to keep BTC above 6k for its significance with the price of mining. Every time it got close to 6k, it would bounce up eventually, but it would receive a weaker height with each bounce throughout 2018. The market was clearly dying and they could no longer keep it above that level artificially anymore. I suspect that huge crash on the 14th was one of the aforementioned players giving up and dumping their holdings. If you look at the tiny volume on that chart during the 13th and early 14th, it may be an endeavour to bring some life back into the market ? It is the timings of those moves and the fact that they prompted big buying volumes which I find interesting. Was this the defensive group you speak of - or was it “short covering” - and why didn’t the price go back up on all that buying ? - Who was selling to them ? Why did it bounce off 5200 ( the last “floor” was at 6200 ) - is there a new one now at 5200 ? It’s possible only with CFDs. If you’re trading on a crypto exchange (real coins) - short is not an option. In the days of Livermore and Gann - they went short by “borrowing shares” selling them and buying back later. Presumably that could be done - assuming you could fnd someone to lend you a coin ! Unless they’re all clamouring to sell their own ! I’ve been watching BTC’s movements for some time now. And if one was to take notes - (at HITBTC) you can see that there are daily movements. When the European/US markets work - the prices go up. When the Asian markets are up and running - they go down. And one can clearly see a movement average each day. Usually within 2-300 USD. So, what’s my idea? Sell the high, buy the low on a daily basis. Rinse and repeat. Keep in mind this will work only while the chart is moving sideways. Don’t go nuts and buy all in, just in case the price drops hard. But with smaller quantities you can make good profits on a daily basis.